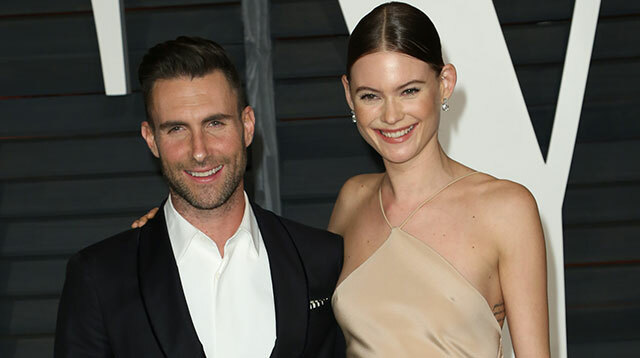 Maroon 5 frontman Adam Levine and his model wife Behati Prinsloo have reportedly become parents to a baby girl. The Victoria's Secret stunner, who was due on Tuesday, has given birth to a baby girl named Dusty Rose, as confirmed to People by Adam’s representative. The child is the couple's first. They wed in 2014. Adam has been anxiously waiting for the baby's arrival, and on Friday, he cancelled a Monday night show in Hartford, Connecticut so he could be by Behati's side when she went into labor. It was the latest date on the band's tour to be affected by the baby—the stars had already postponed seven shows originally scheduled for late September. Those gigs will now take place in February and March next year. "Sadly, it's par for the course with having a baby soon," Adam explained in a video posted on Instagram earlier this month. "It's life, and it's beautiful, but it can be complicated, and I apologize for any inconvenience." Maroon 5 performed their final show before Adam's paternity leave in Worcester, Massachusetts on Saturday. They are expected to resume their tour duties on October 3 in St. Louis, Missouri. The news of Behati's pregnancy first emerged in March 2016. Adam has previously spoken about his desire to start a family with the Namibian beauty. "If I had a kid tomorrow or in five years, that would be beautiful," he said in 2013. "I don't know when that will happen. I don't plan." However, he made it clear he wants a big family: "Like 17," he joked in 2014. "Is that reasonable? I love kids so much, though."